This is just a simple LED limiting resistor calculator I wrote in VB. 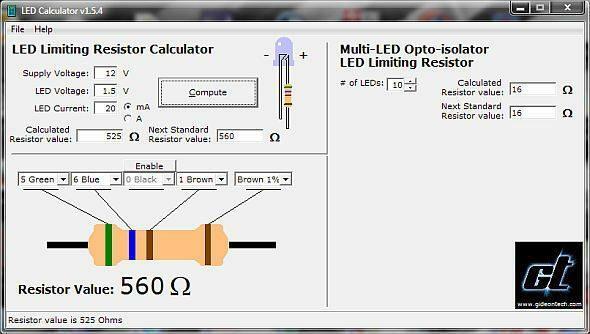 It helps you determine the resistor value you need for your mod LED projects. It can show the actual calculated resistor value and the nearest higher standard resistor value. The standard resistor values are based on the listing in the Digikey catalog. So far, it only has the LED limiting resistor calculator, a little resistor color code utility, and a 4N25 optoisolator Multi-LED resistor calculator. The zip file contains the Setup files for the LEDcalc. Just run Setup.exe and install it like any other program. This includes the VB runtime files used. I will prepare a pack without the runtime files to keep the pack at a small size since some of us already have the runtime files installed. I I get complete KIT of amplifier. I’m from INDIA.